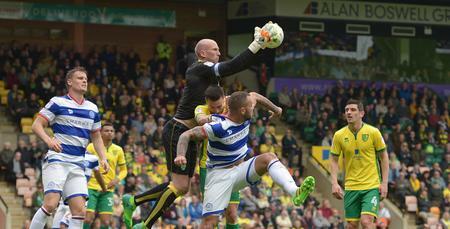 QPR suffer heavy defeat at the home of league leaders Norwich City. Goals from Emiliano Buendia, Marco Stiepermann, and Teemu Pukki put the hosts 3-0 up at the interval and, despite being reduced to ten men when Buendia was sent off with 20 minutes remaining, they added a fourth through Pukki late on. It was a tough afternoon for the R’s under caretaker manager John Eustace against a side who look certain to be returning to the Premier League following a three-year absence from the top flight. John Eustace made five changes for his first fixture in charge, bringing in Darnell Furlong, Geoff Cameron, Jordan Cousins, Ebere Eze and Nahki Wells. Mass Luongo missed out through illness. The R’s lined up in a 4-4-2 formation, with Joe Lumley between the sticks behind a back four of, from left to right, Jake Bidwell, Joel Lynch, Furlong and Angel Rangel. Luke Freeman started on the left wing with Pawel Wsolek on the right, while Cameron and Cousins were in the centre of the park. Eze played in an advanced position behind Wells in attack. 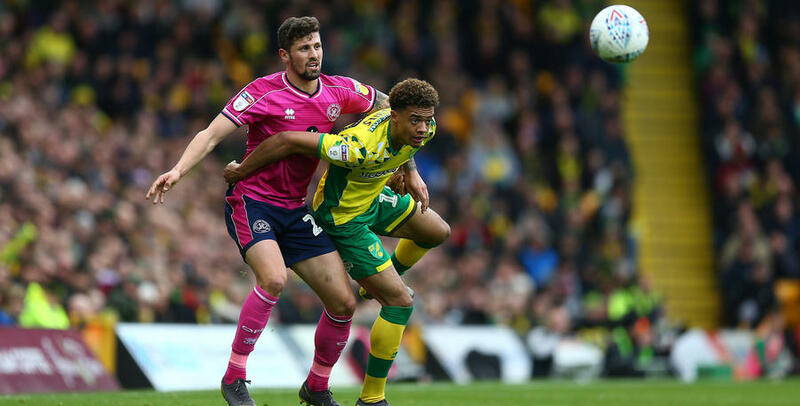 The hosts, meanwhile, were looking for their eighth consecutive win so it was no surprise to see manager Daniel Farke stick with the same starting XI for the eighth game in a row. 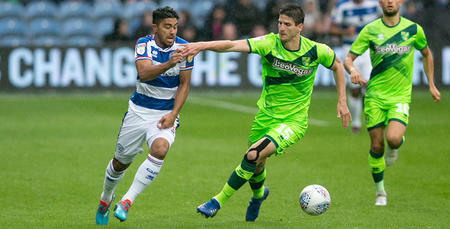 Rangers created a chance in the opening minute when Cousins’ delivery from the left found the head of Wells, but his effort was comfortably gathered by Tim Krul in the Norwich goal. At the other end, Lumley had to be alert to deny the in-form Teemu Pukki who had a go from a tight angle. But after just six minutes the league leaders were ahead when Max Aarons was found in space on the right and he pulled the ball across the six-yard box for Emi Buendia to slide the ball beyond Lumley. Rangers’ difficult afternoon had become even tougher, and the hosts started to pass the ball around with the sort of confidence you would expect from a team at the top of the table. And on 12 minutes their lead was doubled through Marco Stiepermann who had a go from the edge of the box and fizzed the ball into the bottom corner of the net. Six minutes later Onel Hernandez forced a smart save from Lumley as Rangers battled to avoid going three down against a rampant Norwich outfit. It should have been three on the half-hour mark when Pukki pulled the ball back from the right for Hernandez but he squirmed his shot wide of the far post from 12 yards. Eustace changed the approach on 33 minutes, replacing Bidwell with Toni Leistner and moving Rangel to left back with Furlong stepping across to right back. Buendia was next to go close for the Canaries but his shot was saved by Lumley. 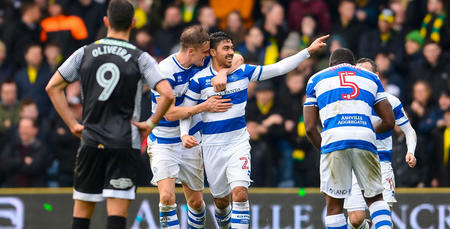 The R’s then had their first real chance since the opening minute when Rangel hit a fierce volley from the edge of the box. It was destined for the bottom corner but was well saved by Krul, diving to his right. But on 38 minutes Norwich did get their third. An uncharacteristic mistake from Freeman allowed Buendia to pick up possession and he found Pukki who tucked the ball beyond Lumley. Stiepermann grazed the roof of the net with a free-kick just before half-time as Norwich continued to dominate the opening period right up to the interval. After the break, Norwich continued to enjoy the lion’s share of possession without creating too many chances, unlike the opening 45 minutes. Furlong forced Krul into an excellent save as he headed Freeman’s corner goalwards as the R’s tried to find a route back into this fixture against a side right at the top of their game. On the hour, Eustace made his second change of the afternoon by bringing on Josh Scowen for Cameron. The impressive Buendia continued to find pockets of space and nearly made it four on 65 minutes bus his effort from the edge of the area drifted just over the crossbar. But that was to be his last action of the half as a late challenge on Scowen saw Buendia issued with a straight red card by referee Scott Duncan. Eustace reacted to the numerical advantage by bringing on Bright Osayi-Samuel for Wszolek. And the former Blackpool man almost pulled one back after only being on the pitch a matter of minutes as his effort from the left squirmed through the legs of Krul, but he was able to gather at the second attempt. Rangers rearguard to dispatch the ball into the top corner. It concluded a difficult day on the road for the R’s.